These excellent people are the best kind of neighbors: friendly, generous, considerate, fun, reliable, kind, genuine. Instead of our usual quick conversations in the driveway as we’re coming and going, we could relax and enjoy a few hours together over good food and wine. 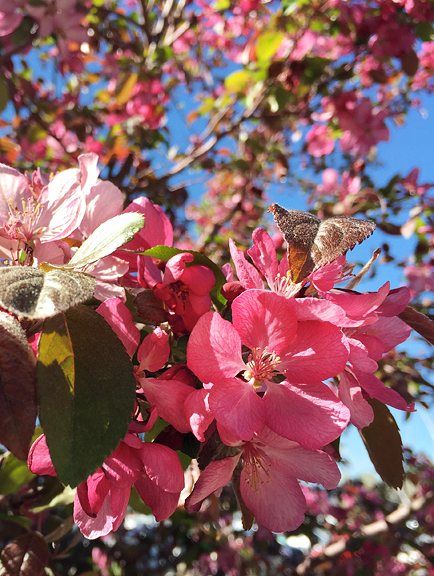 We miss them in summer, when our neck of the woods is at its greatest splendor. “Walk home safely!” I joked after them as they stepped into the night. The snow was just getting started after several warm and sunny days, materializing out of the darkness as it fell into our porch light’s sphere of illumination. I’ve learned to contain my excitement about the snow until it’s here, on the ground, and accumulating. The skis are ready, but we must be patient and wait for the base to rebuild. It might be a few hours. It might have to be tomorrow. In the meantime, we opt for hot soup over a fresh salad while the world outside turns silent and white. Soup. I love all manner of soup. Digging deep into my childhood, tomato soup was the default on those rare snow days in Virginia. Of course, it came out of a can with a red and white label. It only took me a few decades to realize the beauty of making my own tomato soup, and then a few more years to discover the flavorful roasted version. It’s easy. I’ll show you. Without a doubt, the essence of the soup will be superior if you use tomatoes that are in season, but tomatoes around here are in season during the summer. I neither want to run my oven nor drink hot soup in summer. So I’m using store-bought Roma tomatoes that get a big boost in tomato flavor from the roasting process. Roasting makes everything better. The tomatoes go into the oven for an hour or so. 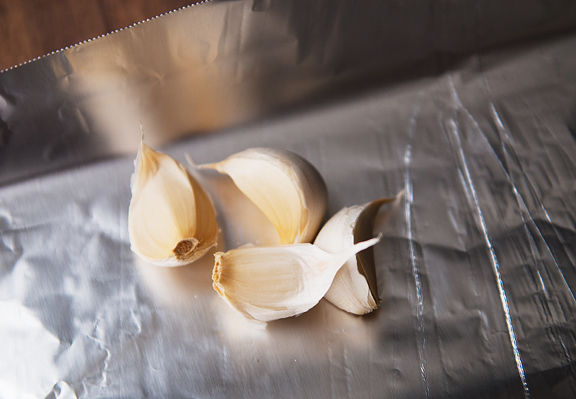 Chuck that foil packet of garlic onto the pan, too. Just a word of warning, put the tomatoes in the oven slowly. I swung around a little too quickly and a couple of my tomato halves went flying off the baking sheet because of the olive oil. 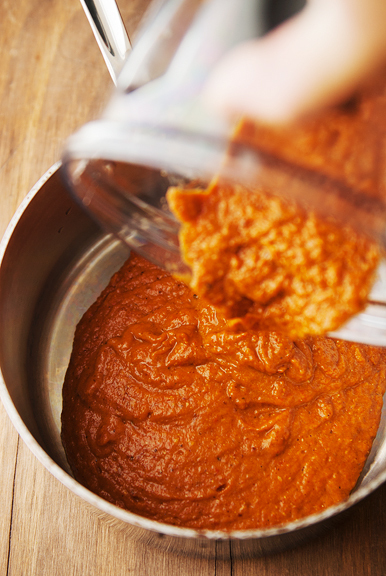 Once the tomatoes and garlic have been transformed into flavor-bombs, place them in a blender or food processor with any excess juices that have accumulated on the baking sheet. This is why you used a rimmed baking sheet – juicy. Purée the goodies. 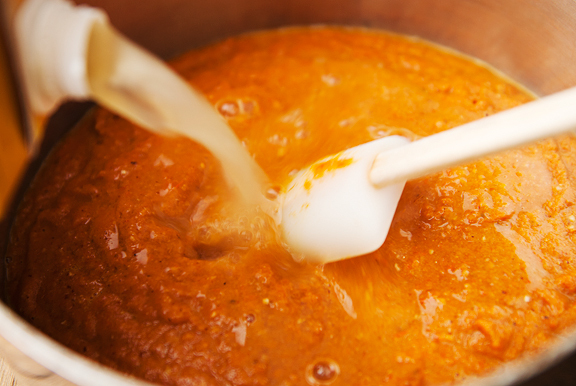 If you like a chunkier soup, then stop shy of a proper purée. 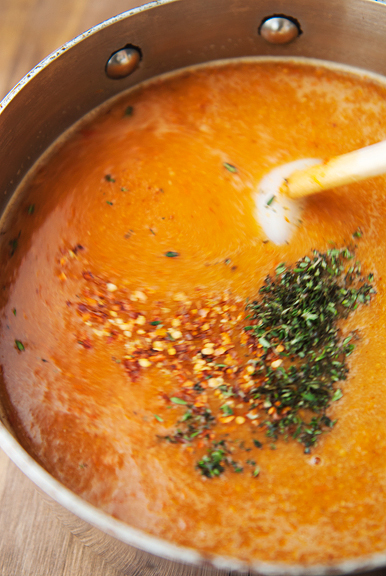 If you prefer a smooth soup, then blitz that sucker all the way. 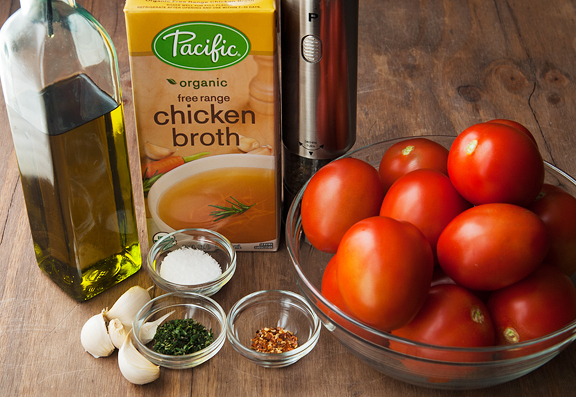 Combine the purée with the chicken broth, herbs, and spices and simmer it for about 30 minutes. That’s it! Roasting the tomatoes makes for a sweeter, more intense tomato soup. The addition of the roasted garlic lends some nutty butteriness. If you aren’t a fan of garlic (how is this possible?) then you can omit it, but roasted garlic is so different from its original unroasted form that I recommend at least giving it a try before dismissing it. In the end, you’ll have yourself a luscious bowl of hot soup that is an upgrade of what we all grew up on. And don’t forget the grilled cheese on the side! Preheat oven to 400°F. 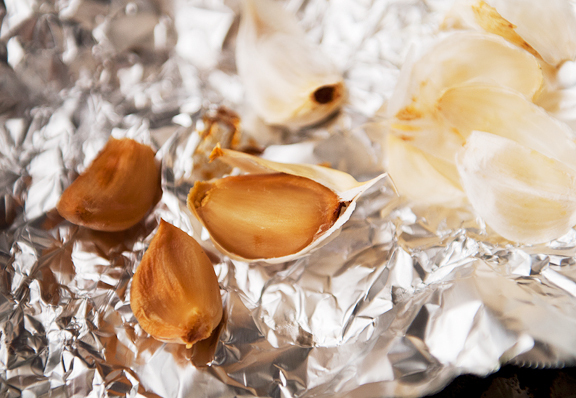 Wrap the garlic cloves in a tight foil packet. 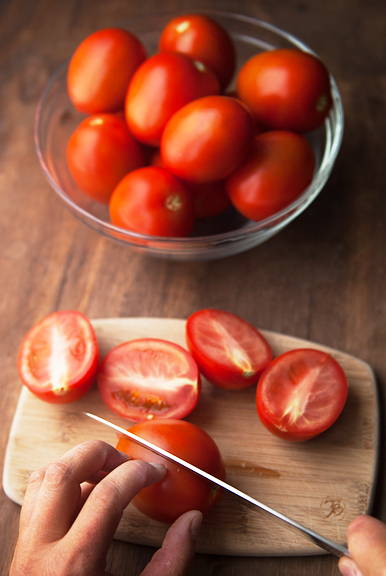 Arrange the tomatoes, cut-side up, on a rimmed baking sheet (I lined mine with aluminum foil). 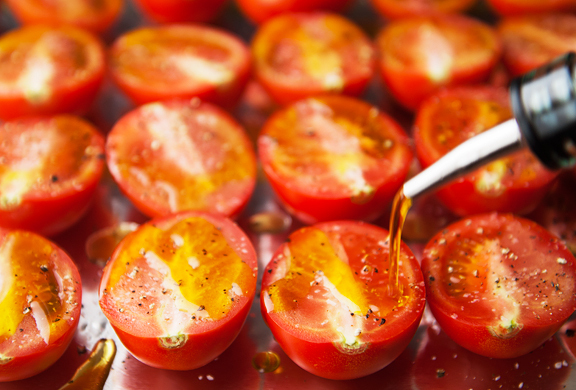 Sprinkle the tomatoes with salt and pepper, then drizzle with olive oil. Tuck the garlic packet somewhere on the baking sheet. 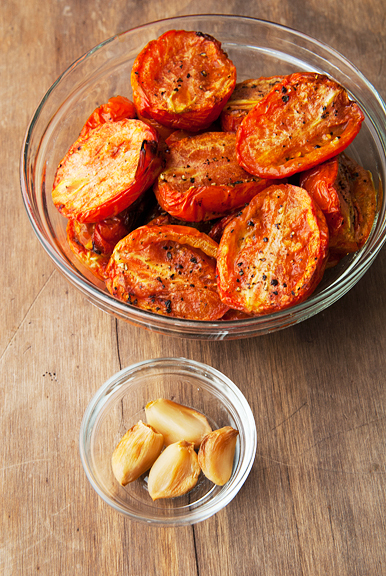 Take care when moving the tomatoes to the oven – the olive oil makes them very glidey. 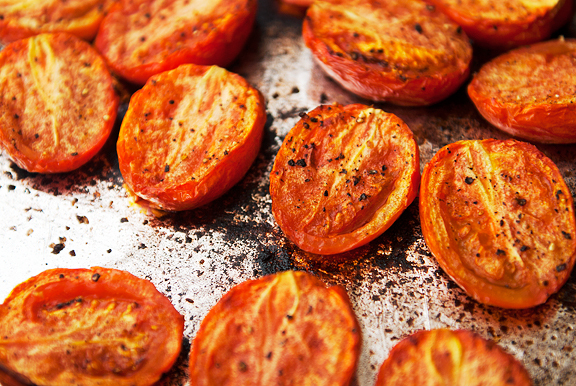 Roast the tomatoes for about an hour until they are browned and tender. Remove from the oven (the garlic, too). Peel the garlic cloves. 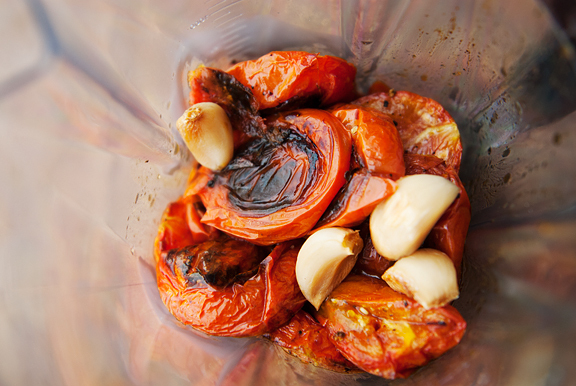 Place the garlic, tomatoes, and any juices from the pan into a blender or food processor. Pulse into a rough purée and pour into a medium saucepan. Add the stock, thyme, and red pepper flakes. Bring to a boil over medium-high heat and then reduce to a simmer. Simmer uncovered for 25 minutes. Serve hot. Serves 4. Agree with you, how can one not be a fan of garlic? 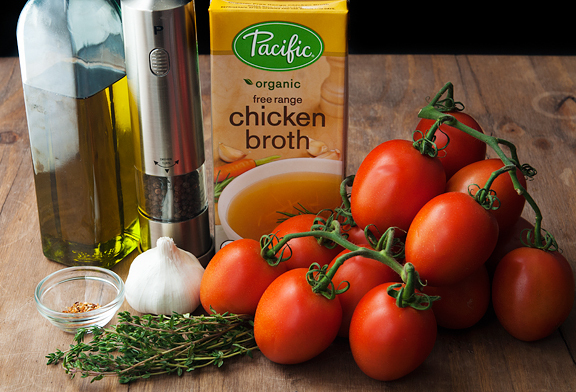 This looks like an amazing soup, can’t wait to try it! Wow- it looks amazing and the skewered grill cheese sandwich dipping into the soup makes me want to try this right away. 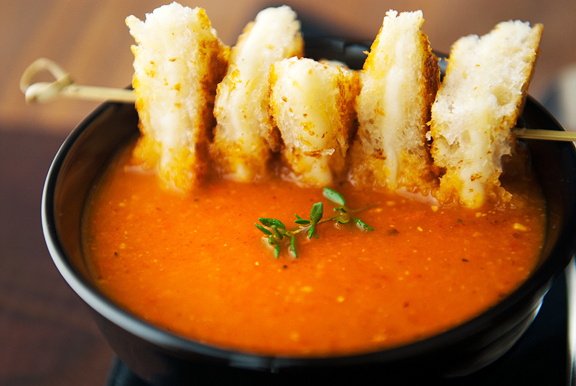 I love the skewer of sandwiches laying across the soup – cute and delicious! OK….back to studying for finals…finals? what’s that? This soup looks amazing and I will to try to make soup like this by myself :) Can’t wait to try this. At first I thought the grilled cheese was skewered shrimp! The soup looks wonderful. I hope you get to enjoy your snow, and also that it hasn’t completely done in the flowers! Currently in Salida, and must have 8″ accumulation overnight! 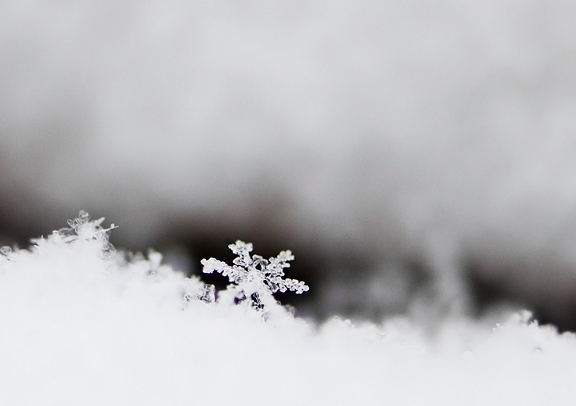 Big snowflakes!!! You’d be squealing! My mouth is watering…this looks sooo delish. Question…What are your favorite cheeses for grilled cheese sammies? I always love tomato soup, but this one should be better than anything that I had had before. Got to try it next winter. Virginia is warmer now (than Ned) so I will have this next winter. I cannot get over your casual description of “some appetizers”! Holy OMG that looks so fabulous that I want to dive right in. 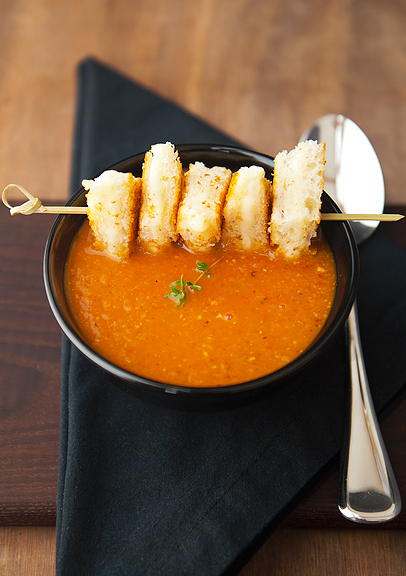 Also, grilled cheese on a skewer suspended over tomato soup. I’m yours! 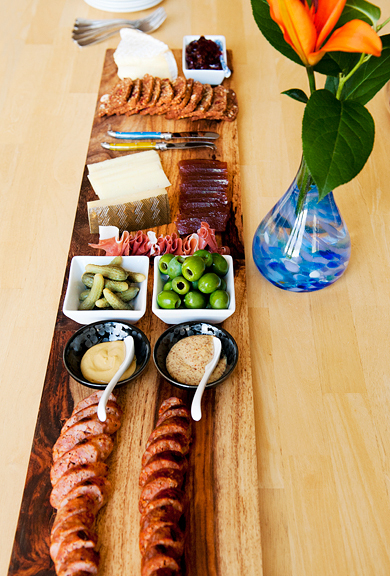 Cindy – oh lemme see, it’s brie, fig jam, seed crisps, manchego, membrillo, prosciutto, cornichons, castelvetrano olives, dijon mustard, spicy brown mustard, andouille sausage and chorizo sausage. sarah – the grilled cheese seals the deal! termet – I hope you enjoy it! Kristin – I think the snow was where it needed to be – in the mountains ;) The flats were spared and just got mostly rain, which they also needed.